This report offers critical insight for big brands who are grappling with the emergence of the Collaborative Economy, and for the startups that are driving this growth. For those new to the term, the collaborative economy is a powerful, if nascent, movement in which people are getting the things from each other, it’s a combination of trends like the sharing economy, maker movement, and co-innovation. That means that people go to a site like LendingClub to get funding for their new project, rather than a traditional bank. Or, they may go to a site like Etsy or Shapeways to get custom made goods, or go to a site like eBay to buy pre-owned goods, instead of buying new products from retailers. In each of these cases, the crowd is self-empowered to get what they need from each other. But while the collaborative economy is poised to disrupt many industries, there is remarkably little data on how many people participate in sharing and making, who they are, and, most importantly, why they do it. Our report paints a picture of the sharers in the collaborative economy and provides important recommendations for businesses that want to win in this new economy. Re-sharers: Those who buy and/or sell pre-owned goods online (for example, on Craigslist or eBay), but have not yet ventured into other kinds of sharing. 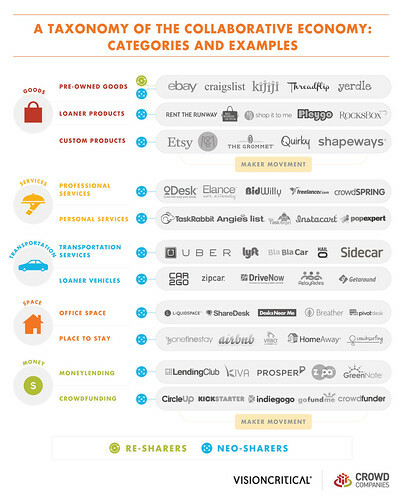 Neo-sharers: People who use the newer generation of sharing sites and apps, like Etsy, TaskRabbit, Uber, Airbnb and KickStarter. Non-sharers: People who have yet to engage in the collaborative economy. Although many of these non-sharers intend to try sharing services (in particular, re-sharing sites like eBay) in the next 12 months. In Dec, I launched Crowd Companies, an association for large brands that want to partner with the Collaborative Economy, to help these large companies navigate, find partners and shift their business models, hard data is needed to make real decisions. Partnered with Vision Critical, we’ve worked hard to launch a survey across 90,000+ respondents in USA, Canada, and the UK, to find out exactly how they share, buy custom goods, P2P lend, and crowd fund. Crowd Companies council members will receive a private briefing with myself and Alexandra Samuel, my co-author, and we’re hosting an event for council members at SXSW this coming Friday. Breakdown by demographic: age, location, political party, marriage status and more. Recommendations for corporations: market opportunities, and specific departmental impacts. There are nine graphics, which we’ll explore in future blog posts, here’s two key frameworks and graphics at industry level. Above: We’ve segmented part of the collaborative economy (there are still unexplored areas such as co-innovation, 3d printing and crypto-currencies) into five major categories: goods, services, space, transportation, and money sharing. These span the sharing economy and maker movement. In both methods, this enables people to get what they need from each other –rather than buy it from inefficient corporations. Above: We asked the thousands of respondents about their intended usage over the next 12 months, helping us to forecast behavior usage based on explicit responses. There’s significant growth in the sharing of used goods (up to 46%), but the overall growth rate will slow. Neo-sharing services are on the rise as custom services, personal services, places to stay, crowdfunding and moneylending to achieve double digit adoption rates. Above: The larger infographic, which you can embed on your site. Ill cross-link to key reviews of this report, leave a comment below if I miss one, or reply via a tweet. Hubspot: The Collaborative Economy Is Coming for Your Business. Are You Ready? This report is based on two surveys conducted between October 2013 and January 2014 by Vision Critical’s Voice of Market with participants from the U.S., U.K. and Canada ages 18 and over. The initial survey of 90,112 respondents provided data on the overall incidence, frequency and nature of participation in the collaborative economy. The questions regarding the collaborative economy were imbedded in a general omnibus survey covering a variety of topics. The topic of the collaborative economy was not mentioned in the invitation to the survey. A follow-up survey of over 2,500 sharers provided deeper insight into the nature of participation in the collaborative economy and in particular, on respondents’ most recent sharing transactions. The data is demographically representative of the adult (18+) populations of the U.S., U.K. and Canada. The results were weighted by age, gender, region and education, to be representative of the demographics of each nation. The margin of error—which measures sampling variability—is +/- 0.3% for the sample of 90,112 and +/- 2% for the sample of 2,517, 19 times out of 20. Special thanks to the extended Vision Critical team, including , Andrew Reid, Alexandra Samuel, Andrew Grenville, Jenny Smelyanets, and others.